The Museum Bertozzi & Casoni is the first permanent contemporary art exhibition dedicated to ceramics. The exhibition is housed in the ground floor area of the Cavallerizza Ducale in Sassuolo, a building that has been renovated and brought back to life thanks to the work of Franco Stefani and Studio Pincelli. This marvelous piece of architecture has now regained a cultural and social purpose. “The exploration, analysis and study of processes have always underpinned my scientific approach to the exploration of different schools of thought in art. Science and art have always been linked by universal values, as the Italian Renaissance clearly shows. Leon Battista Alberti, Leonardo da Vinci and Piero della Francesca were not only artists, but also prestigious and respected scientists. In the Renaissance, the creation of a work of art was the combined expression of science and artistic culture, in which objects, proportions and points of view were calculated according to artistic principles, the same principles recognized by the leading scientists of the time. Art and science have always changed languages and techniques throughout history. This ability to innovate and refine seen in the Renaissance can also be found in the processes that we have created in 50 years of industrial automations which are unique in the world. In the same way, the works of Bertozzi & Casoni are able to bring ceramics into the world of contemporary art, using techniques that require innovative skills and technologies. 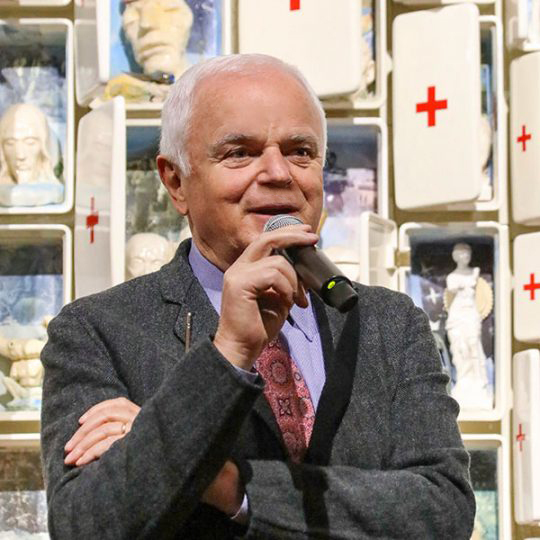 The Museo Bertozzi & Casoni is a tribute to the artists and is my gift to Sassuolo and the entire territory, so that ceramics can be seen for the first time in a new light, inside a building that forms part of our cultural heritage: the Cavallerizza Ducale. You will be able to find works created with materials and techniques never seen before, supported by the latest industrial processes and technologies.